Journal of Genetics and Molecular Biology is an international, Open Access, peer-reviewed journal that publishes high quality articles on the latest advancements and current research in the field of genetics and molecular biology. Journal of Genetics and Molecular Biology provides an Open access platform for young scholars, researchers, and students engaged in the active research in genetics and molecular biology fields. 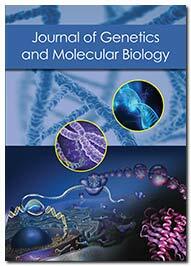 Journal of Genetics and Molecular Biology will provide up to date information on recent advancements in genetics, molecular biology and its current & potential applications in genetic and molecular medicine (like information on diagnostic testing for the early detection of the diseases or recurrence, risk stratification, prognosis, prediction of treatment response, monitoring, and drug dosing), biotechnology, and other allied fields. Journal of Genetics and Molecular Biology seeks to publish recent research outcomes from Genetics and Molecular Biology field. It accepts articles from different disciplines including but not limited to: Molecular genetics, Evoluationary genetics, Developmental genetics, Heredity genetics, Behavioural genetics, Genetic analysis, Gene regulation, Gene expression profiling, Genetic variation, Epigenetics, Gene therapies, Cellular genetics and molecular biology, Population genetics, Quantitative and computational genetics, Microbial genetics, Genetics in medical field, Signal transduction, Genome and systems biology, cancer genetics and molecular biology, Aging, Cell energetics, Drug metabolism, genetic disorders, Computational molecular biology, rDNA, CRISPR, and all other genetic and molecular biology techniques. Besides these submissions on studies involving works on molecules of life (DNA, RNA, proteins, and other biomolecules) are also accepted. Journal of Genetics and Molecular Biology accepts Research Articles, Review Articles, Mini-review, Case Reports, Opinion, Letters to the Editor, Editorials, Rapid and Short Communications, and Commentary on all aspects of genetics and molecular biology. All submitted articles are subjected to thorough peer-review prior to their publication to maintain quality and significance of the journal. The published articles are made freely and permanently accessible online immediately upon publication, thus improving the citations for the authors in attaining impressive impact factor. Analysis of Onchocerca volvulus ÃÂ²-tubulin gene polymorphism in the Mbonge sub-division of Cameroon: Evidence of gene selection by ivermectin. The 24-Quadruplet genetic code thriving on codon potency, codon integrity, codon uniqueness and codon compatibility.